If I had to pick one favorite designer right now, it would be Proenza Schouler. Jack McCollough and Lazaro Hernandez have created pieces that are beautiful and inspiring, pushing aesthetics beyond boundaries — it’s no wonder they’re nominated for both the Womenswear Designer of the Year and Accessory Designer of this year’s CFDA awards. 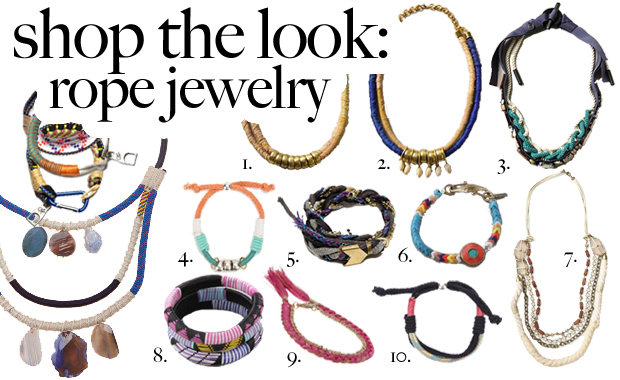 While I’m obsessed with everything they do, I’m particularly in love with their S/S 2011 jewelry. The colorful rope, binding and gems make it completely drool-worthy and the perfect accent for a summer outfit. Over a bright outfit, they add another element of color, and with neutral styles they provide a powerful pop of interest! Alas, despite my love affair with Proenza Schouler, this working girl can’t afford such fabulous designer duds. But budget is no limit for style, and I’ve found some high and low alternatives to bring a little bit of Proenza into your closet! Orelia Pink Rope Detail Bracelet— $22.16 (on sale!